I'm WAY behind on my shoes tales!! 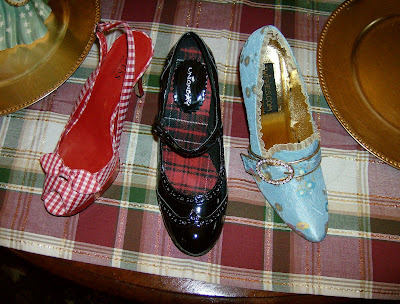 I'm going to cheat and show you three pair at once, since I already have the photos! Pair #1 is a cute red gingham platform in a modern style with a vintage pinup girl in mind. These are Guess brand and I got them on clearance at Burlington Coat Factory last year for $25. Pair #2, adorable black patent Mary Janes, with a spectator look. They are made by UnionBay. I got those at Burlington as well. I don't remember how much, but it had to be under $20. 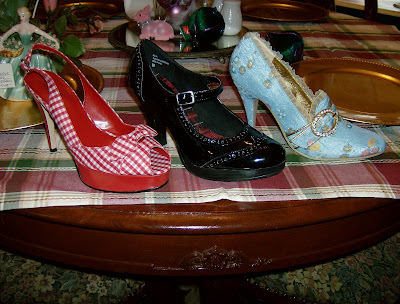 Last but not least~ My Marie Antoinette shoes. I RARELY pay over $20 for shoes...and even MORE rarely pay over $40 (unless they're vintage). But I had to have these beauties. I haven't even worn them yet, but since I want to revamp my wedding gown into a Marie Antoinette inspired frock, I'm sure I'll be wearing them with that. There had better be a good Halloween party this year! Unfortunately I cannot remember the maker... and I should because I about burned my eyeballs out searching the internet for them. Ah! Hold on.... it's all coming back to me now! Ellie brand. Here's a link, tho it's not where I found mine. They have the blue, cream, black, and PINK! I really adored the pink ones, but felt the blue looked more French. Ohhh, I love the red platforms. So Sweet. I used to wear "Candies" platforms, back in the day. I would have loved these. Shoes are soooo cute!!! Hey, my sister is moving to MO...do you live near ST. Louis? My sister is moving to Tedely? I can't even find it on the map...have you heard of it? email me if you know of it....thanks. I want them all! Don't think my feet would fit in any pair of those though! Oh how I love shoes!! And handbags! I don't think I will be wearing a naughty Scarlett costume for awhile- don't wanna get myself in trouble again!!! But man it is cute!! I thinnk my husband would gain a new appreciation for GWTW!!! I love the glovebox and the bike from the previous posts! Oh my goodness the detail on that box!! I have never seen one like that before! I almost didnt put the preggo picture in the post! I felt SO huge that night!! People are now afraid of me when I go out in public- like they are afraid of having to be responsible if my water breaks! It's quite comical actually!!! LOL!! I love 'em all! I love the I Want Candy montage in the Antoinette movie. The costuming is stunning in that one. And let me tell you, that Scarlett costume is too precious. Go for it! What adorable shoes!! I can't even begin to pick a favorite! Those are so cute, especially the red pair and the French ones. And that costume? whoa! Thank you for visiting my blog! You asked about the color of my door, it is Sherwin Williams paint and the color is Rosemary (SW 6187). It is a very beautiful green. We have a large living room and that is the color on the walls with white trim. It's very, very soothing, and looks great in the day and evening. We're very happy with the color! Love the shoes!! I love the blue Marie Antoinette ones - I don't think I'd wear them except as a costume, but aren't they absolutely perfect for that? As for the Naughty Scarlet Costume - Whoo! Those shoes were made for YOU!! So was the naughty Scarlet costume! Hee-hee! Hmmmm............ I'm sure that costume wasn't in the movie....hehe........ it's really cute and the shoes, Oh how I love shoes !!!! Awesome shoes! They are really pretty! It is awesome though. Stuff like that keeps the fire in a marriage! Those are darling in blue and very Marie"ish". Too cute! Plus they're cheaper then the pair I found...now I have to go buy a pair. These kinds of attributes consist of strong observe records, rich histories (virtually every one a definite comes coming from Exercise or any Western eu region), as well as the using high-quality in addition to exceptional gold and silver coins along together with gemstones, most which often resulted buy knockoff Christian Dior inside creation of Replica Chopard watches a Replica Hublot watches thing that could expense approximately thousands regarding us all dollars: an extravagance best replica Breitling watches UK mens enjoy or possibly a luxurious girls observe. It is a writeup about four see makes that Swiss Replica Watches might have celeb spokespeople of most sorts. A few you should understand right apart, a few you may well be aware regarding face rather than your brand and others, may well not recognize in any way. Who's the maximum? Which subsequently luxury see manufacturer gets the finest variety of spokespeople? An individual opt.